I figured today I would share a Halloween photo (since we just celebrated Halloween on Friday here in Madison). This is actually a photo of my mom on Halloween 1960. 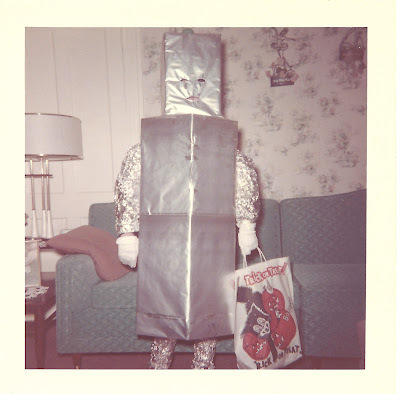 You have to admit her homemade robot costume is pretty crafty. Don't you love thinking of your parents when they were kids? I love the photo, but my favorite part of this photo is the story that came with it. When my mom and Pop George (my grandfather) were looking at this photo with us they pointed out that they actually built the costume on her. They put her in the boxes. They wrapped and taped up the paper. They wrapped her arms and legs with tin foil. Now that you're looking at her all perfectly wrapped up... take a moment to think about her getting into the back seat of a car without being able to bend at the middle (unless they completely took the costume apart). She had no choice but to lay in the back seat of the car. From their story telling I can't look at this photo without imagining my mom struggling into the back of the car and then laying sprawled out flat on her robot back across the back seat. And THEN what it must have looked like for her to get out of the car. I giggle every time I see this.